Oh dear, oh dear, just checked two TBH's who have a slab of fondant on the mesh floor in a takeaway food box. 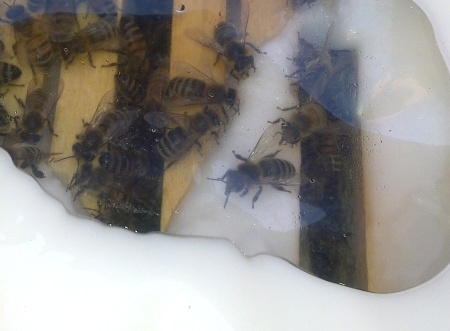 Both swarms collected late June and neither made much comb or honey so I decided they would need feeding. The hives are on the edge of woodland. I was devasted to find dozens of dead bees in the wet edge of the fondant, I think they got stuck in the wet fondant. I know sugar absobs moisture but didn't expect it to turn to liquid so quickly. It is very wet this winter (again) and wish I had just poured sugar in which I have just read about. 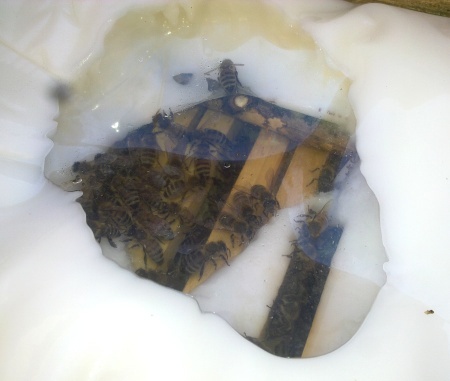 Has anyone else had this problem with wet fondant, or perhaps the bees were not strong enough to climb out of the sticky stuff. I have all but given up on fondant, mainly because I don't seem to be able to make it consistently to the right consistency. I suggest you cover yours with dry sugar to kill the stickiness, and just use dry sugar from now on. Feeding it from the floor in winter is not ideal, and I would be inclined to pour sawdust or vermiculite over the rest of your mesh floor to improve heat retention. The right consistency comes from the right wrapping of the fondant. If you feed from above, the winter cluster sits right below the fondant package. The fondant package is completely wrapped, just a small opening - I do two parallel cuts. The bees eat their way up. 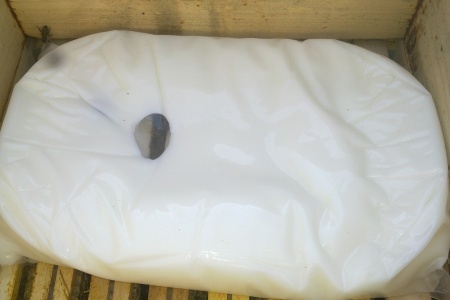 Here you see that the warmth is rising into the bag and the air's humidity (bee's breath) collects at the upper wrapping. So they can eat and drink inside the bag. The sugar draws water vapor, too. Which is a problem if unwrapped. Because it is too sticky first and then it drys up like a rock. Doesn't happen with a decent wrapping. Here they ate up their way further. 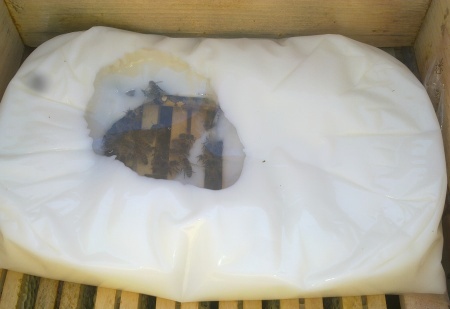 Bees can walk from the comb right into the bag. At the end of the winter the "head of the winter cluster" is completely stucking in that bag. Most important is the fact, that the warm air is trapped in that bag and a sucessful winter feeding all depends on warmth. The warmer, the better the winter feed is taken. Thanks for that suggestion, will use sawdust and dry sugar, I can hang the fondant up, but will rely on the sugar instaed. 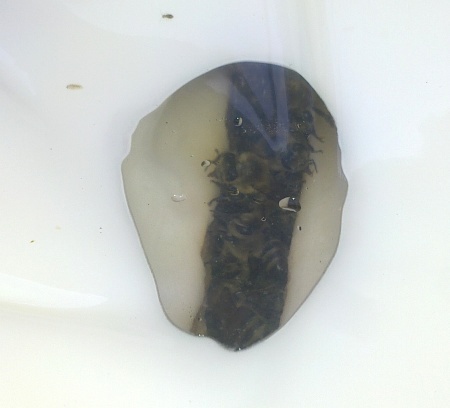 I had been feeding fondant in a miller feeder over a top bar with a slit drilled in it and had the same problem with bees getting stuck. I followed Zaunreiter's method and today was rewarded with the sight of a half empty bag teeming with bees! I will be using this method from now on. Thanks zaunreiter. zaunreiter. do you have a recipe for your fondant that goes in the bag? Dubluvva, I am curious how you managed this. I assume you put the special top bar on while it was still warm enough for the bees to move around? Trying to replace a top bar while the bees are clustered and cold... Yea just don't see that happening. Then once it warms up you need to remove the bag and the cut bar I assume. Have any pictures of the process? Mmmmmm. Mead... Nectar of the gods! I do love this idea. I'm just not sure how to get the girls to cluster up underneath the top bar with the hole or slit in it. So, you mention you tried this and it worked for you? They clustered under your modified top bar to get into the bag? My question re: the baggie feeder. What stops the bag from collapsing when the majority of the contents have been eaten? Possibly smothering bees in the process. Is there positive air pressure somehow that keeps the top of the bag "afloat"?